Why Do Hardwood Decks Need to be Cleaned and Restored? Our sun in Colorado is especially harsh on outdoor wood surfaces. Over time, it will bake the color right out of almost any type of wood, leaving the wood unprotected and exposed. After the natural color is gone, any wood deck will get progressively grayer and darker, becoming unsightly and dirty-looking. That’s where we come in. We know how to clean, refinish and seal your hardwood so you don’t have to worry about it. You won’t risk damage to your valuable deck and will once again have something you can be proud of. 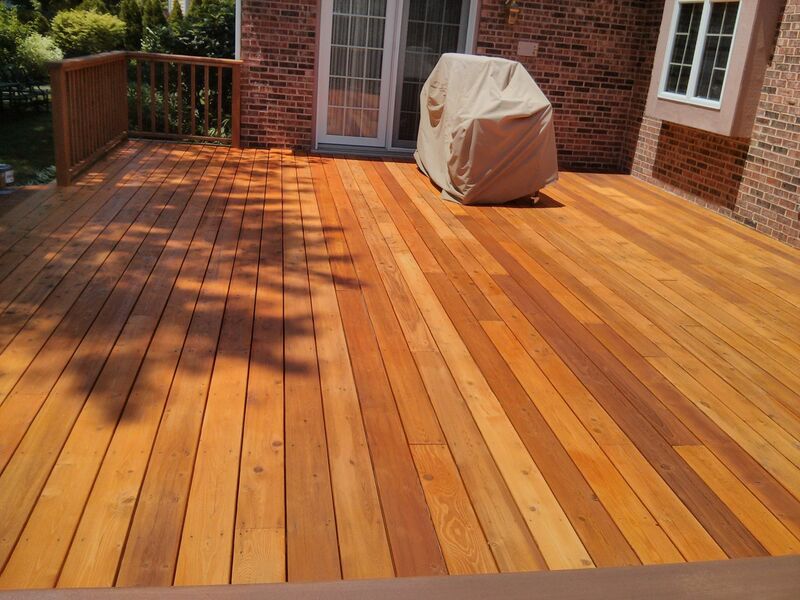 What’s the Process for Cleaning and Refinishing Hardwood Decks? While every job we perform receives a custom approach, many follow a basic pattern for treatment. First, we clean and brighten all the surfaces of your deck which separates the gray, dirt and any old sealers from the wood and leaves your deck looking like it did when originally built. Next we carefully sand your deck where necessary to remove any deep stains or scratches. Lastly, we treat your deck with a penetrating, protective sealer that will leave your deck protected and looking its best. The entire process can usually be done in one or two working days with your beautifully restored deck dry and ready for use the very next day after service is completed. What About Maintenance After Cleaning and Refinishing? O’Leary and Sons recommends maintaining your newly restored deck on a regular schedule once it has been cleaned and refinished. After you have had your deck professionally restored, regular maintenance is the only way to ensure that you can keep your deck properly protected and looking its best all the time. We will follow-up with you to monitor how your deck is aging and custom-tailor the right maintenance interval for your particular location and usage. When the time is right, our mobile crews can maintain your deck and you don’t even have to be home. We’ll simply remind you with an e-mail when the right time for maintenance is and you’ll let us know when you’re ready for it. That’s all there is to it!